TaskClone's powerful Todoist integration is easy to setup and and offers flexibility to send tasks to any Todoist project. IMPORTANT: We connect to Todoist in two ways: Direct & Email. Direct is easier to setup and does not require Todoist Premium. Initial setup uses this process. Email setup takes a few extra minutes and requires Todoist Premium, but then allows you to add due dates, labels and priorities to your tasks. After initial setup, you can configure email setup. The instructions below cover both. You can always change your setup method. Note: For instructions on connecting your Source App before connecting Todoist, see Connect Evernote or Connect OneNote. Click in the search field and find Todoist (direct). Once selected, click the "Connect Todoist" button. 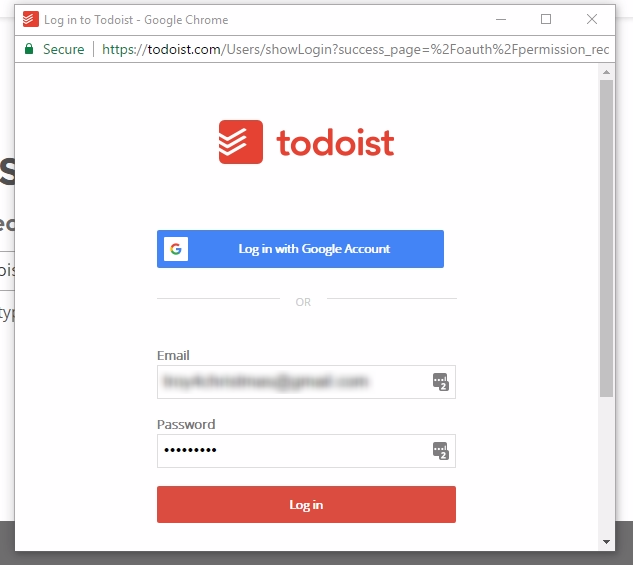 Login to Todoist in the pop-up window that appears. After authorization, you will be prompted to select a Todoist project for your tasks. Note: You will need access to your Todoist email address for this process. Select Todoist (email) as your destination. You'll be prompted to enter a Destination Email which you can find in Todoist. A. 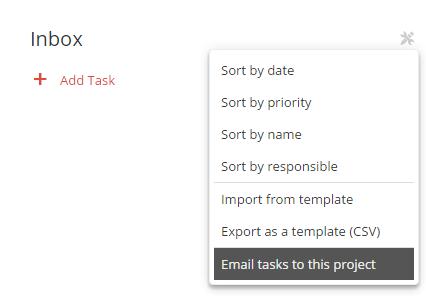 In Todoist, open the project where you want TaskClone to send tasks (e.g. Inbox) and select "Email tasks to this project" from the settings menu for that project. B. Copy the Todoist email address that displays. C. Paste that email into the Destination Email field in TaskClone and click "Save & Continue". Important: Be sure to remove any extra text and brackets from the email address (see example below). [Todoist Business Only] Add the wildcard "@taskclone.com" to list of Email Addresses you wish to accept tasks from - See todoist instructions for this. TaskClone turns tasks you type in Evernote into emails sent to your task app. Todoist can read the email subject to add details to your task. Add priorities by like "! !1" or "! !2" or "! !3"
Add due dates like ""<date tomorrow> or recurring like "<date every day>".